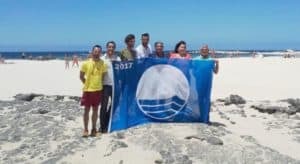 This week, Playa de La Concha (Shell Beach) has announced it has become another El Cotillo beach awarded blue flag. Many local businesses, as well as the La Oliva Ayuntamiento (town hall), were involved in obtaining this award. 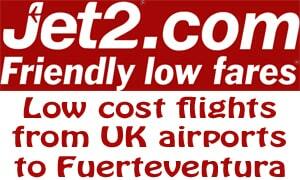 This is the most popular beach in El Cotillo with families as it provides lovely sheltered safe swimming for children. The Blue Flag is an annual award and an environmental quality certification system developed by the FEE in 1987. It promotes and rewards participation in voluntary environmental initiatives of the municipal authorities, the local and visiting population and the agents of the tourism sector. The criteria for obtaining the Blue Flag are grouped into four areas: bathing water quality, environmental education and information, environmental management and safety, services and facilities. The Blue Flag is granted by an International Jury, presided over by the FEE and participation, among others, of the Agencies of N.N.U.U. For the Environment and Tourism, among the candidacies selected by the National Jurors. The Jury for Spain, chaired by ADEAC, the coastal regions, the FEMP and the Ministries, Foundations and Universities involved.